The new media publishing industry is a marvel of evolution and we face disruptive changes that challenge traditional publishing methods. Your customers are getting their information in new ways, how will you compete? Newzware is a cost-effective business software platform that will help you produce, assemble, deliver and profit from your efforts in the modern publishing age. Newzware is an established provider of circulation, advertising, production, financial, editorial and professional software and service solutions for the publishing industry. Newspaper and media professionals rely on timely and reliable processes to efficiently manage the production and financial workflow, leaving time for creativity and thoughtful management of new industry challenges. Newzware, as a division of ICANON Associates, provides the software solutions to manage the former and the customer support to assist with the latter. Newzware users obtain and share information, manage their resources, generate revenue and remain productive all within the protective framework of Newzware Software Solutions. Most importantly, our users develop a comfort in the knowledge that we are there when they need us. Newzware support is unmatched in the industry. Further, ICANON believes that you need only invest in these software tools one time. The software vendor should be responsible for keeping their product current and meeting the demands of its customer base. That is why all Newzware Customers under Support & Maintenance Contract continue to receive all Newzware license upgrades at no additional cost. We appreciate your visit to our web site and we invite you to learn more about ICANON and its Newzware publishing software products. Call us at 800 544-4450 and select "Sales: or simply click Here. Newzware exhibiting at Local Media Association, Feb. 22 - Feb. 25, 2017, Orlando- Good sessions and great company. For more venues, select the NEWS tab on the toolbar above. Offer your reader audience integrated options for purchasing your on line protected content. Restrict them to tone dynamic or use a blend of offerings to satisfy your customer. The following Newzware E-Pass attributes are available to market your media content. Used in conjunction with the E-Authentication feature within Newzware Circulation Web self service, maximum revenue is obtained from your digital content visitors. Newzware E-Pass can be used with most CMS systems and is easy to implement. There is no revenue share contract and is available for web, tablet and mobile footprints. 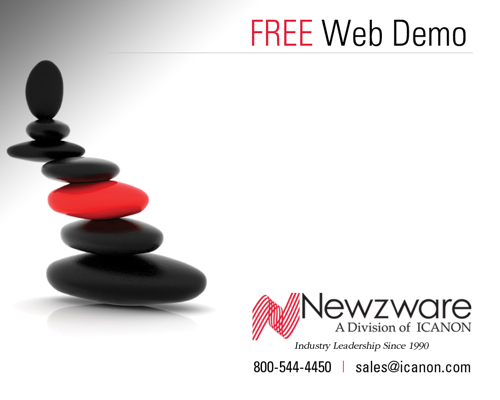 Increase your Newzware value further, call Sales for a demonstration and pricing. © ICANON Associates, Inc. Newzware. All rights reserved.